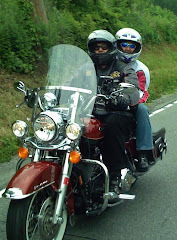 What do Golf and Harley Davidson Motorcycles have in common? Today, Lake Isle Golf and Country Club received an unlikely visitor to its 9th tee box: a 2010 Harley Davidson Nightster motorcycle! You might ask what a tough-looking 1200cc HD Nightster would be doing riding through the rough (but not on fairways and greens) of a private golf course today? New Roc Harley Davidson, located in in New Rochelle New York, sponsored this golf hole (as well as the remaining par-3's with other great gifts) in order to benefit the American Diabetes Association. The golfer who gets a hole-in-one on the 9th hole will win this hot motorcycle! So you see, golf and Harley Davidson motorcycles partner well...especially when it's for a great cause! 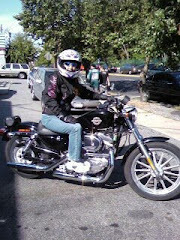 Of course I don't know if motorcycle riders will ever look good in plaid! Can British Open winner Louis Oosthuizen's "trigger" help you improve your golf game? Louis Oosthuizen's victory in The Open and the discovery of the "Red Dot" concentration trigger that helped him win has golfers wanting to understand exactly how it works. Here's how. The concept comes from a behavioral technology called Neuro Linguistic Programming (or NLP), a fairly new branch of psychology that attempts to improve a person's mental and emotional behavior. The teaching assumes that specific goals or actions (neuro) can be better achieved by "anchoring" (programming) past experiences with reinforcement stimuli such as touch, word or sight (linguistic). Louis Oosthuizen marked the now famous Red Dot above his thumb on his left glove after working with Sports Psychologist Dr. Karl Morris. During practice, when he was 100% focused and ready to execute a shot, he would look at the Red Dot and "anchor" this mental state with that sight. Then, during competition, looking at the Red Dot as part of his pre-shot routine would automatically recall that feeling and make his mind enter that exact same state. The goal of NLP is to bring together the conscious and unconscious minds. 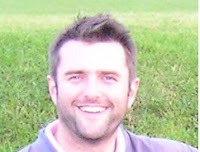 In this case, Oosthuizen would first make conscious analytical decisions on how to best play the shot. Then by looking at the Red Dot, a reaction would be triggered by his unconscious mind to adopt the emotional state associated with that visual anchor. The unconscious mind does not reason, is not logical and makes no judgments. Its primary job is physiological, in regulating body temperature and breathing. But it is also a repository of feelings (hence your dreams) which (if triggered correctly) can be recalled by the conscious mind. In a game where performance can be massively impaired by conscious thinking, bringing the non-judgmental unconscious mind into the shot process can only help our scores. Confidence plays such a huge role in performing well in golf, so it is important to be able to recall (on demand) those times you felt success. The pre-shot (and post-shot) routine is one of the most important factors in achieving this. Getting yourself into a confident, positive mind-set will massively improve your chances of success. And this is exactly what the "trigger" does. Golf is an unusual game in that it lasts 4-5 hours. For this reason it is imperative to be able to switch on and off - relaxing as much as possible when you can and conserving energy to give EVERY shot your best concentration. During the intense pressure of The Open, Oosthuizen was able to relax in between shots, safe in the knowledge that his Red Dot would take him into the necessary state of mind to give every shot his absolute concentration and focus. It reinforced his practice and gave him the self-confidence to execute. That anchor will automatically start to produce the desired action, which is to recall that same focused state of mind. When you hit a good shot, anchor that too in the same way. Then try it on the course and make your new "trigger" part of your routine. This will tell your unconscious mind to adopt that optimal state of mind and you will be ready to play the shot as best you can. The Golf State of Mind Audio Teaching has been designed as a tool to optimize your mind to ensure that you get closer to your potential EVERY time you practice and play. By using techniques to increase your powers of imagination, visualization and feel, you will discover a whole new, and more powerful, approach to golf game improvement. Listen to it on the way to the golf course or practice range and you will start to play fearlessly, remove negative interferences and become transformed into a better and happier golfer. Through learning how to synchronize your body and mind with visual and feel based exercises and learning a consistent approach to each shot, good golf will become a simple subconscious process. Don't continue to waste any more time practicing in the wrong way!!! To sign up for your FREE eBook and course of eLessons please click above link. Is Tiger Woods really "finished" or will he break more golf records? Last week, Drew Magary offered five reasons as to why he believes Tiger Woods is washed up or "finished" as a professional golfer. Think he's right? Magary claimed that Tiger Woods "has put his entire being into chasing Nicklaus and we, as fans, have followed him for over a decade assuming that the record would eventually be in his grasp". Because, "he has to know, deep down, that this doesn't mean anywhere near as much as it used to" the writer believes that Woods cannot ever return to his original greatness. 2. He isn't made for this kind of adversity. 3. Other players are better now, and they aren't scared of him. 4. Turns out, Tiger Woods is not preternaturally immune to pressure. 5. He's not Tiger Woods anymore. So who is he? Magary believes that the demise of Tiger Woods predominately lies in the scandal that followed him around for the past year and that his brand identity (his real persona) has suffered a fatal blow. In my opinion, a person with the right mental attitude can rebound from any type of adversity and it can actually make that person stronger. Although it may take some time to shake off the effects of the past year (he should have taken the year off from golf), Tiger Woods will come back with more resolve and the fans will forget his infidelity. Tiger Woods' new "player" persona may actually increase his popularity in the long run! Who will rebound faster, Tiger Woods or Elin Nordegren? After nine months of letting Tiger Woods command the stage with his numerous teary-eyed tantrums and public apologies, Elin is now taking to the periodicals beginning with the latest People Magazine in which she tells "My Own Story." This issue is going to sell a lot of copies! Although Elin "has been through hell", she now feels "stronger than I ever have" although I don't think it's because she is now a very wealthy woman. Will Tiger Woods will be able to move on and play golf with the same determination as in the past or will he continue to be he trapped by his own insecurities? "I wish her the best in everything" Tiger Woods commented after his pro-am at the Barclays adding "I certainly understand that she (Elin) is sad". Who could survive "without trust and love" in a marriage? The PGA Tour Wives Association has partnered with Sentient Jet and the Bergen County's Children's Aid & Family Services for a charity "Green Carpet Affair" tomorrow. This exclusive invitation-only cocktail party is scheduled to have about thirty PGA Tour players and their wives in attendance at a private home in Saddle River, NJ on Tuesday, August 24th from 6:30 - 9:30. I understand that "lavish" hors d'oeuvres and cocktails will be served. There will also be a silent auction of "experience" items such as a Ryder Cup flag signed by the entire winning team. a day at The Kingdom from Taylormade. Tickets start at a very reasonable $275 and I understand that there are a few still available for purchase! Visit www.cafsnj.org for more details. Kodak and the PGA TOUR today announced that hole Number 13 at The McGladrey Classic on October 7-10 has been added to the 2010 Kodak Challenge schedule. Infamous (?) number 13 at the Seaside Course at Sea Island Golf Club in Sea Island, GA was selected based on the recommendation of tournament host Davis Love III. The McGladrey Classic will be the 27th of 30 holes in the $1 million Kodak Challenge competition. Rickie Fowler currently leads the Kodak Challenge at 12-under-par. The Kodak Challenge celebrates beautiful holes and memorable moments on the PGA TOUR and challenges players to perform their best on 30 designated Kodak Challenge holes. A few of the memorable Kodak holes this year were the 18th hole at the Arnold Palmer Invitational and the "Wild Hole" at TPC Scottsdale. PGA Tour golfers must play at least 18 of the 30 designated Kodak Challenge holes. The player with the lowest cumulative score on his best 18 Kodak Challenge holes will win $1 million. The Kodak Challenge concludes on No. 17 at the Children’s Miracle Network Classic on November 11-14. The McGladrey Classic joins the Kodak Challenge at a highly competitive juncture. Fifteen PGA TOUR players are currently within three strokes of Fowler, and another eighteen sit four shots back. According to Steve Powell, director of program development for the Kodak Challenge, The McGladrey Classic is a great addition to the final chapter of the Kodak Challenge season. “No. 13 at The McGladrey Classic brings added excitement to the final stretch of the Kodak Challenge, as it gives pros a challenging, yet viable scoring opportunity. With just seven holes to go and more than 30 TOUR players within striking distance of our leader, our Kodak Challenge hole at Sea Island is sure to deliver some great action,” Powell commented. Golfers need to take steady aim off the tee as this dog leg left has bunkers along the entire right side of the fairway and a marsh along the left. Depending on the wind, a driver will still leave golfers with a middle iron in to the green, which is protected by a front side bunker. Since the Kodak Challenge records a player’s best 18 Kodak Challenge holes scores, pros with a full Kodak Challenge scorecard can move up the leaderboard quickly. Once a player reaches 18 holes, subsequent holes (beyond 18) provide the opportunity to replace bogeys and pars on their Kodak Challenge scorecards with birdies (or even eagles!). This can create a one, two, or even three-shot swing in a player’s score on just one hole. Several players within striking distance of Fowler have bogeys to replace, including Steve Lowery (-10), Jimmy Walker (-9) and Aaron Baddeley (-9). Three other players at 8-under-par have bogeys on their Kodak Challenge scorecards. Kevin Streelman claimed the first Kodak Challenge title at the PGA TOUR’s final event of the 2009 season, the Children’s Miracle Network Classic in Lake Buena Vista, FL. Streelman’s early-round birdie at No. 17 on the Magnolia Course clinched the Kodak Challenge crown, netting the second-year TOUR professional the Kodak Challenge trophy and the winner-take-all $1 million prize. Congratulations to my Executive Women's Golf Association (EWGA) friends! at Villa Roma GO GET 'EM Ladies! 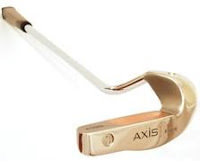 Can the Innovative Axis1 Putter Help Lower Your Golf Score? The new Axis1 putter has received its share of accolades, from "Most Innovative Putter" to "Best New Golf Product". The creator of the "Eagle" putter (Luis Pedraza) adopted a scientific approach to this "alien-looking" flat stick (?) giving it a shape that it not only looks unique but for many performs when the heat is on. The Axis1 Eagle putter was designed to be perfectly balanced so that it resists being "pulled open" when twisted in your hands allowing you to lighten your grip without the clubface opening. 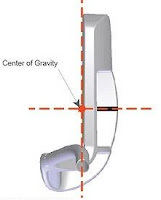 The weight is pushed forward "with a patented heel counter weight that places the center of gravity right on the center of the striking face perfectly aligned with the axis of the shaft." 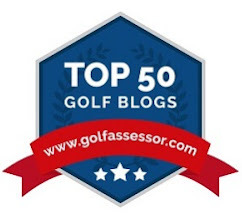 The result is that the golfer should have fewer off-line putts, resulting in lower scores. But, isn't a putter a very personal golf club? You have to like it, from the feel within your grip to the style of it. The putter should instill confidence each time you pull it out of your golf bag and every time you make a stroke on the putting surface. Although there have been numerous testimonials confirming the "physics" and design of the Axis1 putter from Pro Golfer Patrick Sheehan (who uses it on Tour) to equipment reviewers and golf club manufacturers, how well did the Axis1 Eagle Putter perform in the hands of a mid-handicap (12-15) golfer? Since the time of this article the Axis1 has only been created for right-handed golfers (sadly, the majority of players.) I had to hand over this unconventional putter which I was to test to my husband Barry, asking him to swap out his trusty Odyssey Two-Ball for review. It isn't easy to replace your trusted putter for a new one. New golf clubs take time to get used to, no matter what club you change out of your bag. That being said, Barry liked the Wynn grip which he said "has a great feel to it." It's also a "good-looking putter which can lead to a confident putting stroke." The balance of the Axis1 putter was also commended for not having a single pushed putt. The shaft is perfectly balanced with the face and the weighting allows the putter to glide without the golfer having to add force. Technically speaking, "the center of gravity is right on the center of the striking face and perfectly aligned with the axis of the shaft." "The reason my eyes have trouble getting used to the putter is because when I look down the shaft, I see the shaft in the middle of the ball which makes me think I may hit the ball with the shaft instead of the putterhead." Although he still has some difficulty with it, another golfer who tried the Axis1 putter had a similar reaction. This putter is a conversation-starter. When Barry pulled the new Axis1 putter out of his golf bag, he was greeted by curious stares from fellow golfers who asked to try it out on the green. Wonder at the design caused initial interest and upon first try, each of the golfer's reactions were similar. The Axis1 does not produce immediate results right out of the bag: it takes time and practice to get accustomed to the change in stroke caused by the balance of the putter. Many golfers' strokes are personal as putting goes hand-in-hand with "feel" and not necessarily with science. The Axis1 Eagle putter can help reduce the number of pulled and pushed putts and help straighten off-line strokes. Combined with the correct speed and distance caused by a confident stroke, this putter can be a solid addition to both novice and low handicap golfer. Read more about the Axis1 Putter. I wonder if Phil Mickelson ever thought about the consequences of turning forty and the possible unwelcome side-effects? Five days before the U.S. Open (and right before his big birthday), Mickelson awakened with "intense pain" and couldn't move. Lefty's doctor visit found him to be suffering from psoriatic arthritis but a weekly treatment of shots seems to have put the symptoms under control. A friend of mine once mentioned that turning forty was no picnic; to be wary of the bevy of doctors visits, new meds that you will be taking, etc... and now I'm getting worried! From doctor's visits to a 'one-eighty' turnaround in diet, Phil Mickelson is a changed man. A veggie burger doesn't really taste like the real thing, no matter how much you tell yourself it does but, after a few bites, it's not so bad. Mickelson said of his new-and-improved diet, "As long as I believe that there’s a possibility that it will help me overall, yeah, I’ll continue to do that. If it will somehow keep this in remission or stop it from coming back, yeah, I’ll be able to do it. But I haven’t been put it to the real test. The real test is driving by a Five Guys and not stopping.” Five Guys is the Burger Joint in which Phil bit bought into. A few parting words from Mickelson? "I’m probably not as sharp as I would like to be." I must admit, when I first accepted the assignment to spread the word about the once-in-a-lifetime Golf Coastal Canada Adventure contest, I didn't know much about Atlantic Canada, its provinces or heritage. A bit of internet research and a passion for golf and travel led me to reasons why I want to visit 'The True North Strong and Free'. 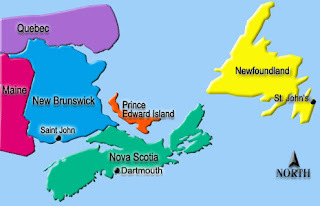 For those golfers who have never ventured into Atlantic Canada, there are four distinct provinces with flavors all their own: Prince Edward Island, New Brunswick, Nova Scotia and Newfoundland. The Atlantic provinces are not only meant for vacationers seeking to play golf at some amazing courses, but they are also filled with endless dining and cultural opportunities, making this a "must-see" region for those searching for a multifaceted Canadian adventure. Prince Edward Island (PEI or 'the Island' for short) is the smallest and greenest province where it is said 'the air and water are fresh and clean'. PEI is known for fresh lobster and Malpeque oysters harvested straight from the bay! With over fifty lighthouses and ninety island beaches, the home of "Big Break XI" will tempt you with it's natural wonders and challenging golf courses! River Mill Golf Club is the site of Big Break XI, but I understand that two of the courses featured in the contest, Green Gables and Crowbush, are equally considered "must-plays" on Prince Edward Island. Green Gables, recently updated by Thomas McBroom and on the North Shore is "a scenic, ocean-side course with rolling greens guarded by deep bunkers, six water holes, an ever changing breeze". Crowbush Golf and Beach Resort has a five-star, four diamond rating. The Links at Crowbush Cove on the eastern side of PEI have received numerous accolades from Golfers Choice awards to Best Scenery and Best Condition. 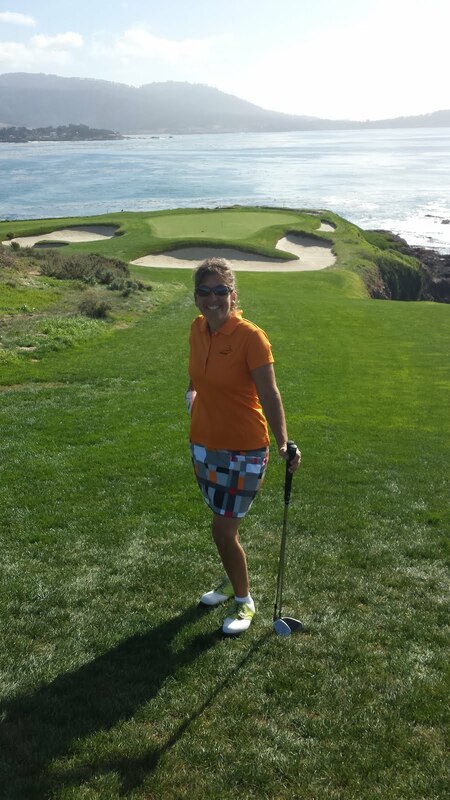 Although beautiful, she is also known to be challenging, laden with pot bunkers and water hazards. When visiting New Brunswick, you won't know whether to spend your time walking the sandy beaches, discovering the reversing falls or enjoying spectacular golf courses. Why not do it all? From the Algonquin, redesigned and one of the oldest and most challenging golf courses in Canada to Kingswood Golf Course (seven water hazards in the first six holes), the choice of which golf club to pull from your bag will depend on the topography and direction of the wind. Nova Scotia (Canada's Ocean Playground) and Newfoundland (called 'The Rock'), round out the four provinces in Atlantic Canada. Nova Scotia, the most populous province and also the second smallest in area next to PEI, is surrounded by the Gulf of St. Lawrence, the Bay of Fundy and the Atlantic Ocean (and their salmon is deliciously famous!) The two golf courses selected as part of the contest winner's prize are the classic layout of Highland Links which received numerous accolades including a 4 1/2 star rating from Golf Digest in 2008 and The Lakes Golf Club. Newfoundland (and Labrador), the fourth of the Atlantic Canadian provinces, is nature at it's most grand, where I understand that there are whale and rare bird sightings! 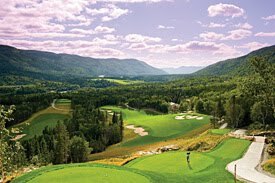 The tranquil Humber Valley River and meandering lakes and streams set the pace at Humber Valley Resort's River Course. Voted “Canada’s Best New Course 2007” by SCOREGolf Magazine, the River Course is an 18-hole, par 72 championship golf course measuring 7,199 yards. Gros Morne Resort (the second course featured in the contest) is centered in the middle of a National Park, a UNESCO Heritage Site and one of only 911 in the world considered as having "outstanding universal value." As you can see, a visit to Coastal Canada's Atlantic Region is more than just a few rounds of golf, it's an adventure and should be part of any golfers "bucket list." The Great Coastal Canada Golf Adventure is a nine-day vacation for four people covering all four Atlantic Canadian provinces! Read more about the Contest and Enter today! No purchase necessary. See complete rules for details. Open to New York, New Jersey and Pennsylvania residents only. Garden State Fireworks at Peekskill Celebration 2010-Music by Train, "Hey Soul Sister"
Award-winning Garden State Fireworks created this great show at the 2010 Peekskill Celebration. If you wait until the end of this video you will hear that there was a fire on the barge but all turned out okay. The song playing in the background is "Hey Soul Sister" by Train. I love fireworks displays! Lucky for me that there are plenty of fireworks in the Hudson Valley Region, from Peekskill to the great Macy's fireworks display in New York! Five Golf Tips from Michael Strahan? Michael Strahan, fifteen year NY Giants football great, helps actor Brian Baumgartner from "The Office" with the mental side of golf in the webisode, "Golf Therapy: Life Lessons and the Pursuit of Par". 1. Never let other golfers see you are tired. 3. The only person who can beat you is you. 4. When you swing and you hit a bad shot, when you are thinking too much, your inside your own head and blocking yourself. 5. Get over the golf ball and say (don't scream like in the video), "I OWN you...this is MY field"
How much do YOU love this game? This could well be the golf vacation of a lifetime! 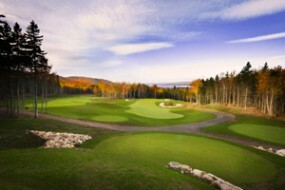 Golf Coastal Canada is giving away a unique golf adventure: nine days of extraordinary golf at many of the best courses in Atlantic Canada, including classics like Highland Links, Green Gables, and Algonquin. You will be flying across all four provinces - Prince Edward Island, New Brunswick, Nova Scotia and Newfoundland - in a your very own private helicopter. Whoa! Grab your golf clubs and pick your three favorite playing partners because Golf Coastal Canada may be sending your foursome on the golf vacation of a lifetime! 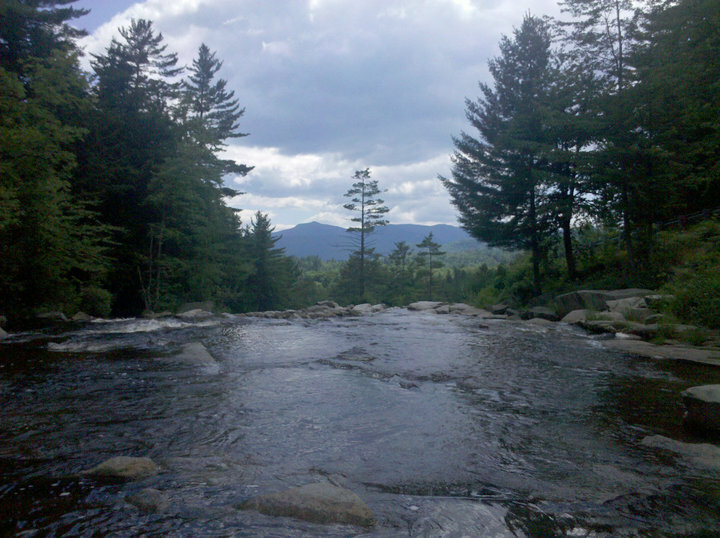 From the scenic White Mountains Forest Preserve to the numerous waterfalls and covered bridges, New Hampshire is truly a nature lover's paradise! The USA is filled with natural preserves but sometimes it is up to us to go out and discover them, and so we did on a recent trip to the Mt. Washington Valley, North Conway area. 1. Moose will forage by the side of the road offering the perfect "photo-opp". In our case, this mom (called a "cow") brought her little ones along; unfortunately this chance encounter caused a traffic jam right at the base of Mt. Washington! 2.Mt. Washington Auto Road: drive yourself 6,388 feet to the summit or take the guided van tour (both for a fee). Before your adventure, ask the front desk for a tour of carriage house where you will see how travelers ventured up the mountain before modern conveniences! Be aware: They make you "climb" the rocks to the stake at the top of the mountain and the view is awesome. Bring climbing shoes. 3. Jackson Falls, Jackson New Hampshire: walk on the rocks along the river. Your trip to Mt. Washington Valley NH will not be complete without driving through the turn of the century charm found in the small village of Jackson Falls. Two important stops are in the kissing bridge (yes, we did kiss) and at the Falls where walking on the rocks can be a spiritually uplifting event! 4. Although New Hampshire is known for its ski trails, why not take a ski lift in the middle of the summer? Our first adventure in the "nosebleed section" left us dangling our feet while gasping at the surrounding White Mountains. 5. The ski lift was only the first part of the adventure...part two was wondering about our descent! Easy choice was to Zip-line down the mountain. We chose Wildcat Mountain because of its proximity to Mt. Washington Auto Road and, at about 1/2 mile long, it has the longest cable line in New Hampshire. More thrills as you descend at about 40 mph but fun for all ages because it doesn't really feel that you are going that fast! 6. Appalachian Trail, Crystal Springs. Hiking is by far one of the easiest ways to get close to nature. The Trail passes through the White Mountains with different levels of difficulty to choose from. We chose the easy Crystal Springs trail so that, again, we could have a few photo opportunities while enjoying the cool comfort of the surrounding trees and waterfall/springs! 7. Playing golf is a great way to commune with nature. With so many lovely golf courses in New Hampshire, it is easy to pick a few that will leave you breathless. 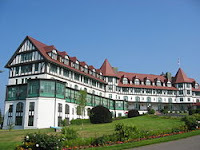 We chose North Conway CC and Omni Mount Washington Resort's Donald Ross Golf Course in Bretton Woods. The view of the mountains surrounded us for the entire two rounds while my golf balls "communed" with the trees and sand traps! 8. Another terrific family adventure is the Conway Scenic Railroad, where you are taken back through time riding on an authentic Pullman car seeing the natural pastures of New Hampshire. 9. Although I can ramble on all day about New Hampshire's natural wonders, no trip is complete without a visit to the spectacular Old Man of the Mountain. From quaint inns to the beauty of your natural surroundings, our vacation to the Mt. Washington Valley region of New Hampshire gave us a reason to relax and forget the daily grind while returning to a more simple time. Just another beautiful day in Mount Washington Valley, New Hampshire!